Impact on the People we Support – Joshua | Service Coordination, Inc.
Joshua is a 20-year-old young man who has autism and bipolar disorder. Josh had been living with his father in Hagerstown from the time Josh’s mother passed away when Josh was three years old. When Josh was around 15, his behaviors became more challenging, resulting in disruptions to his school attendance. He soon stopped attending school altogether, and his father had to quit his job to care for him. Josh’s behaviors also resulted in Josh and his father’s eviction from their home, prompting a several-month period of homelessness. Josh’s behaviors made it difficult for his dad to get Josh to doctors’ appointments or out to explore the community in general. All in all, there was very little life outside Josh’s home for him for nearly five years. During one of Josh’s outbursts in September 2018, a passerby called 911. The police took Josh to the ER for evaluation, prompting DSS notification. Although Josh’s father had requested residential services (Josh had recently been approved for a DDA waiver), he loved his son very much and had a hard time when the opportunity to move forward arrived. 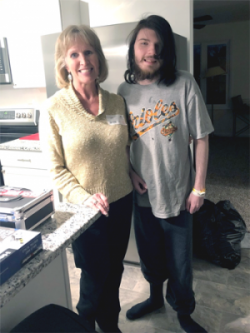 DSS representatives and Josh’s CCS, Lisa Kocis, worked closely for about six weeks to help Josh’s father adjust to this next step, and he eventually accepted that this was in the best interest for both of them. A court-ordered emergency petition was approved, and police took Josh back to the hospital, where he received inpatient treatment to stabilize his behavior in preparation for DDA residential services. His treatment was so successful that several providers were interested in serving him, and he was able to select the one he wanted. From the hospital, he moved into a beautiful, newly renovated home in Hagerstown with his selected provider. Josh is now getting the medical care, daily care and supervision he needs. And, in a true sense, he has begun discovering his community for the first time in his life. It’s a whole new world for Josh, not without some bumps along the way, but an exciting transition nonetheless for this wonderful young man.